When comparing prices on eco friendly pole hedge trimmer rentals in San Jose, Campbell and Santa Cruz, ask about sales tax and environmental fees. Rugged 4 Cycle engine and a long shaft for a variety of hedge trimming tasks. 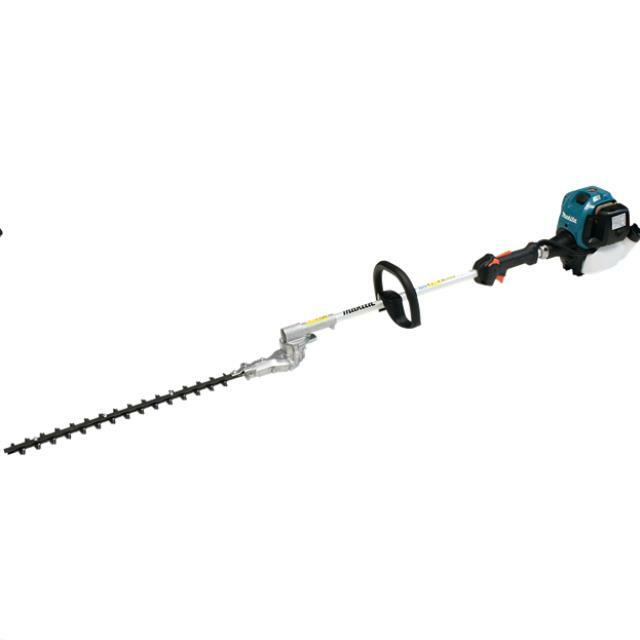 The Makita 24.5 cc MM4 4-Stroke 22" Pole Hedge Trimmer (model EN5550SH) delivers power and ease-of-use for heavy duty applications. The Makita 4-stroke commercial duty engine requires no fuel mixing, and delivers a high blade speed (4,600 SPM) for efficient cutting. For added convenience, the trimmer is engineered with Mechanical Automatic Engine Decompression for quicker, easier starts. Less vibration, and molded throttle assembly with wide-grip throttle trigger for reduced fatigue. Easily adjustable handle configuration for improved balance. Rental includes first tank of fuel. * Please call us for any questions on our 22 inch hedge trimmer regular gas rentals in San Jose, Campbell, Salinas, Santa Cruz, Watsonville, Morgan Hill, Hollister, Santa Clara, Gilroy, Milpitas Sunnyvale, Fremont, Salinas, the Greater Bay Area and the Monterey Peninsula.